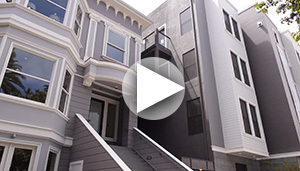 Thirteen Elegant Condominiums	200 Dolores Street - SOLD OUT! All units have been sold. Thank you! 200 Dolores is the premier boutique building in the coveted Mission Dolores neighborhood featuring 13 spectacular condominiums. Three exquisitely renovated units in the historic Victorian home, plus ten new construction residences surround a charming central courtyard. Homes feature luxurious finishes, thoughtful floor plans, professional kitchens, and parking with elevator access to most units from the garage. 200 Dolores includes one 1 bedroom home, eleven 2 bedroom homes and one stunning 3 bedroom home. Most residences range from 1100 to 1500 square feet, and individual unit floor plans are available on the "Floor Plans" tab in the "Features" section. Superior sound proofing between floors. It's home to the city's oldest building and cemetery-one of few still in city limits; but today's Mission Dolores is far from stale, attracting individuals who thrive in this vibrant, ever changing community. On weekends, expect to meet San Franciscans from all walks of life in Dolores Park, where frequent sunny days lure picnicking families, flirtatious sunbathers, athletes, dog lovers and a smattering of hipsters recovering from the night before. A variety of homes -- from multi-unit buildings to Edwardians to freshly built condos -- and warm weather make Mission Dolores attractive to home buyers. This tight-knit neighborhood is a favorite for shoppers, foodies and night owls. It is bounded on one side by Valencia Street, offering music venues for many tastes, fashionable boutiques and an array of ethnic dining options to satisfy even the pickiest diners. The block of 18th Street between Dolores and Guerrero is a dining destination, with renowned restaurants Delfina and Tartine on one block. For a quick bite, there's the popular Bi-Rite Market and Dolores Park Cafe. You could easily have breakfast, lunch, and dinner right here! Workweek transit is easy, whether you utilize the 16th and Mission BART or a Muni line, take to the bike friendly streets or drive to the 80, 280 or 101. Make a splash at the city's only public outdoor pool and sunbathe beneath the building's mural by Susan Cervantes, Raul Martinez, and Juana Alicia. A new wave of unique street food vendors make dinner an adventure. And you can't miss 826 Valencia, a free writing workshop for kids cleverly fronted by a pirate supply store. The project is sold out. Please Call Anne Herrera at 415-601-3353 for information on sales. The 200 Dolores Team is proud to partner with First Republic and Wells Fargo Bank for this project. Please contact Kathryn Lawrence or Chris Liu for information on First Republic's lending products and for loan preapproval. Please contact Craig Barnes or Jason Chapin for information on Wells Fargo's lending products and for loan preapproval. Rusty Wadatz is the Founder and Owner of Rusty Wadatz Design. Prior to starting his own business, Rusty worked for another design firm, helping to design homes and office spaces for high profile clients in the Bay area. He has worked with investors on multiple developments in the San Francisco area. Rusty aspires to strike the perfect balance between sheer artistry and the needs of his clients. Rusty has an impressive ability to not only design from the ground up, but is also able to modernize any room to refresh the style and space. He does all aspects of design from picking tile and lighting to finding the perfect furniture for your home.